My interest in energy and environmentalism has been quite late in coming. As an artist, my mother has always been under the assumption that nothing creative can be accomplished during the daylight hours. Subsequently, I grew up in an environment of the glow of light bulbs while staying up until the wee hours of the morning – lighting up the entire neighborhood from our little home. Likewise, the recycling options in my town were dismal, and thus, I never recycled. And once I started driving, based on the way my family borrows and shares each other’s vehicles, I never found myself having to insert my card at a gas pump. My tank would mysteriously never be empty due to the generosity of my parents. While environmental consciousness has slowly seeped into my private life, it has likewise seeped into my academic life. A couple of weeks ago, I met with a couple of representatives from the embassy of South Sudan in Berlin to discuss the difficulties associated with the country’s development, especially as this country is very rich in oil. I felt fortunate that I was able to bring to this conversation the information in one of the books I had chosen to read about Venezuela, The Enduring Legacy: Oil, Culture, and Society in Venezuela by Miguel Tinker Salas, printed by the Duke University Press in 2009. The US Middle Class Lifestyle Being Imported: As companies began to recruit men with families from the United States, these well-off families began to create a cultural ideal for Venezuelans with aspiring ambitions to achieve. With the new immigrants from the United States also came such forces to Venezuela such as a modern chain of supermarkets (at first sponsored by Rockefeller Investments), parks with “lush green lawns seeded with grasses imported from the United States” (page 157) at the oil camps, and baseball teams. Social investment Conducted by Industry, Rather than by Government: At the beginning of the oil industry in Venezuela, the government lacked the resources to build the necessary infrastructure, leaving the oil companies to do this themselves. They built roads in order to ensure transportation and provided its own security to camp inhabitants. 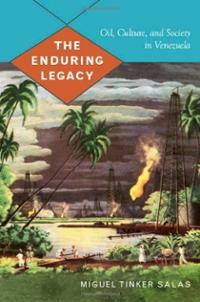 As the oil industry grew and “as they began to recruit foreign employees with families, the oil companies had to attend to the needs… schools had to be built, teachers hired, hospitals and medical staff expanded, and recreation centers enlarged.” (page 144) All of these institutions and organizations were imported from the United States, making it a very strong cultural force. Company Structure Built on Race and Nationality: Located on the Caribbean Sea, Venezuela can be characterized for its racial and ethnic diversity. While prejudice existed during Spanish rule, these prejudices were reinforced by the structure of the oil industry: “The oil companies’ social hierarchy had senior staff employees from the United States and Britain at the top, lighter-skinned Venezuelan junior staff in the middle, and usually mixed-race Venezuelan office boys and secretaries at the bottom… the foreign was assumed to be the purveyor of knowledge, while the Venezuelan was considered the neophyte expected to implement company policy.” (page 186) Likewise, Jim Crow-style segregation was imported from the United States and was implemented in force at many of the camps.